The Charlotte Bobcats play the Cleveland Cavaliers at home Friday. A Friday night game against a visiting team with superstars is one of the few times a year the Bobcats potentially have a sellout. For every fan that will be at the game to cheer on the Bobcats Friday, there will be at least one who came to see LeBron James and Shaquille O'Neal. Speaking of the King and the Diesel, the two of them are coming to town the night before to celebrate Thanksgiving night with us Southerners. 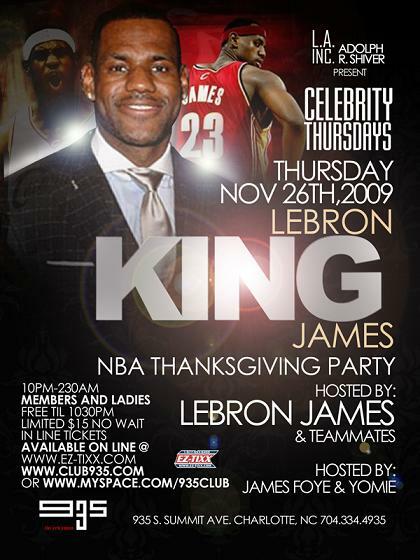 LeBron is hosting a party Thursday night at Club 935. This is nothing new for King James, though. The Cavs play in Charlotte twice a year, and almost every time you'll find LeBron's name as top billing on some club flyer (last December he hosted First Fridays at NV Nightclub and Lounge, which has since been renamed Synergy). He always shows up, too. Well King James must have told his new sidekick that hosting parties is a lot of fun because Shaq is getting in on it tomorrow night as well. But apparently Charlotte isn't big enough for the two of them to host a party here on the same night. 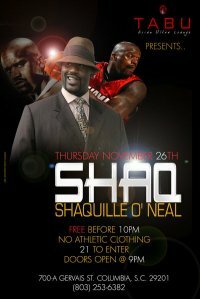 So Shaq is taking over Columbia, S.C. He's going to be the man of the night at Tabu Asian Ultra Lounge (click here for party details). Yeah girl, there's going to be some ballers at the club.